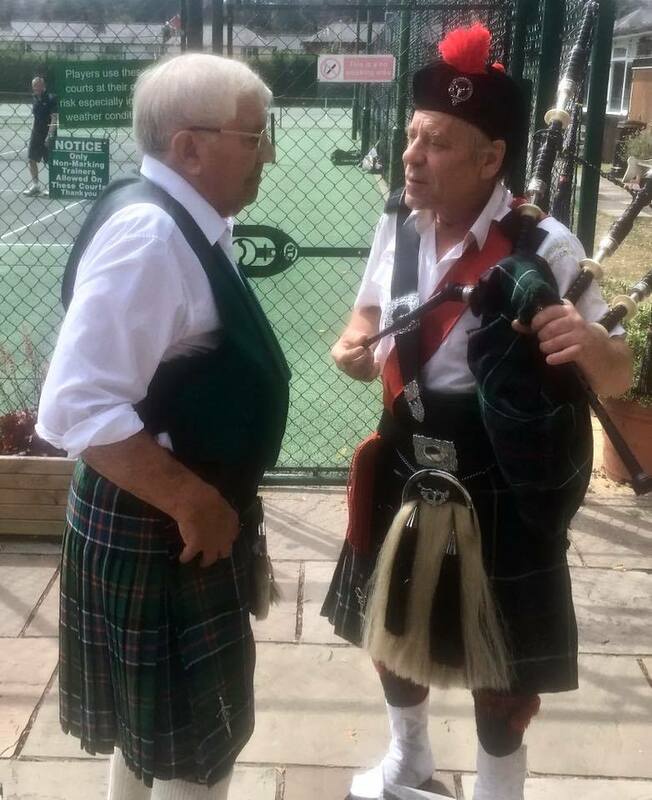 The skirl of bagpipes playing Scotland the Brave was heard over all the courts at Congleton Tennis Club on Tuesday. The occasion was a celebratory lunch for the 90th birthday of Alex Burton, the club’s current president and former chairman from 1975-2015. Over forty members of the club joined Alex in the clubhouse to wish him many happy returns. They were joined by piper Gus Mackenzie who played a stirring selection of Scottish tunes in Alex’s honour. Alex sported his kilt and sporran for the occasion. The members sang Happy Birthday and toasted his health after hearing about Alex’s extensive contribution to tennis in general and to Congleton Tennis Club in particular. Alex started playing tennis as a school boy in Scotland with the Lasswade Tennis Club, playing in the local league and in the army during National Service. He joined Congleton Tennis Club when he moved from Scotland in 1967. Alex joined the club as an ordinary member, he soon became a committee member and in 1975 he became the Hon Chairman of the Club, a position he held for 40 years. In that time, he transformed the Club from having rundown facilities with a small exclusive and excluding membership to be a Club with marvellous facilities with a large inclusive membership, with the strap line “tennis for all ages and all abilities”. Alex got the club back on to a firm financial footing by combining prudent management with enthusiastic fund raising. He led from the front with painting, digging, concreting and erecting a new clubhouse, a second hand temporary building, in the late 1970s. However Alex’s contribution to the fabric of the Club is only a part of what he has achieved. He single-handedly started a junior section to the club. He was the organiser, the coach, the mentor. He ran coaching sessions for hours at a time several evenings a week. He then inspired other people from the growing membership of the Club to join him and help. It is fascinating to try to estimate how many juniors he has encouraged to play tennis over the years. The answer must be in the thousands given the size of the junior membership for over 30 years. Alex also has a proud record as a competitor on the court. He has played in the South and Mid-Cheshire League for many years. His most enjoyable season seemed to be in his late 70s when he captained a team of himself and three juniors. He took great pride in seeing their performance improve week by week under his guidance. Alex still plays tennis once or twice a month. He has also helped by doing jobs around the club. He has been an inspiration to those that have worked with him over the years. He has never stopped working to bring sport into the lives of people whatever their background or circumstances. He has made an immense contribution to Congleton. The lunch and celebrations were organised by Alan and Chris Flatman, and Peter and Jill Walshaw.